Posted on April 24, 2018 April 15, 2019 By Nikkie M.
A beautifully planted, flourishing garden brings calm, peace and beauty to your home. But when you have garden pests, that serenity can turn to an ugly patch of land that brings stress and an eyesore. Depending on the insects and the plants, garden pests can decimate a garden in no time. After spending time, money and energy into the preparation of a garden, who wants their efforts to be ruined by a bug infestation? 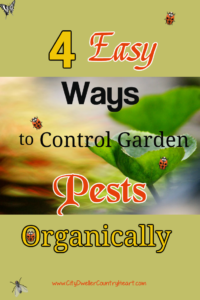 Well, here are a few simple ways to rid your garden of common garden pests. One of the easiest ways to control garden pests is to use companion planting. Companion planting refers to planning certain plants that act as natural repellents near plants that attract certain insects. 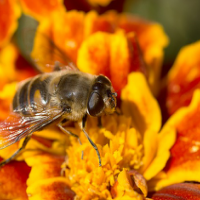 For example, garlic, onions, and marigolds are not only great repellants but also great at attracting beneficial insects to the garden; insects that will destroy plant killing insects but not your plants. You can choose to intersperse the plants in your garden or plant companion plants as a border around your garden bed. I do a combination of the two. I like to use onions and garlic for border and plant marigolds and nasturtiums throughout the beds. It not only helps limit the damage from pests, it also provides a punch of color throughout the garden. Another way to get rid of garden pests is to simply remove them. With garden gloves in hand, head out into your garden during the time when the pesky insects are the most active. Search for the pests, making sure to look under the leaves, near the plant bases, and on the ground around the plants. Then, pick them off. After removal, you can relocate them (something that I don’t recommend because they will just come back), or destroy them by squishing them or dropping them into a container filled with soapy water. The most common insects that lend themselves very well to this method are Japanese beetles, tomato hornworms, potato beetles, and slugs, just to name a few. Prior to destroying the offending pest, be sure that it’s not a friendly bug, like a spider or ladybug. Soap can be used as an organic pesticide. Sure you can purchase an insecticidal soap at your local lawn and garden store, but it’s very easy to make, there is no need to buy it. (And it saves money, too). This mixture works great against thrips, spider mites, and aphids (most soft-bodied insects). All you need is a spray bottle, water, and liquid dish soap. Fill the bottle with about a cup of water. Then add a few drops of dish soap (Do not use antibacterial soap. I only use Dawn-not ultra-for this). Now it’s ready to use. Easy, right? Once ready, spay the leaves, stems, and flowers of your plants. Wait a little while, then rinse off completely. Beneficial insects are your friends in the garden. They eat harmful, damaging insects that you may find in your garden. 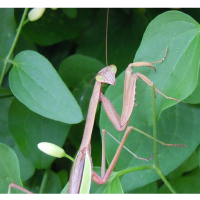 Examples of these friendly helpers are Lady Bugs, praying mantis, lacewings, and spiders. Beneficial insects can be purchased from organic garden supply stores or can be ordered online. Once purchased (or delivered) let them free in your garden and let them do their thing! Now spiders are the exception. Spiders are plentiful in most gardens. Just let them weave their webs and catch flying insects. Barriers, such as old coffee cans with the ends cut off, can be pushed into the ground around young plants. These barriers can be used to prevent hookworms from attacking the young shoots. Insect Neting can also be used as a barrier and works great to keep grasshoppers and cabbage white butterflies out of the garden. 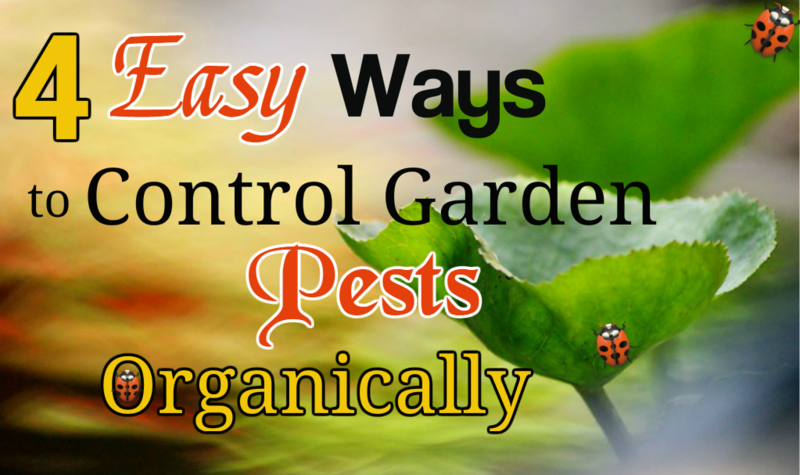 Using companion plants, insecticidal soap, manual removal, beneficial insects, and barriers are great, easy methods for controlling garden pests. These methods are non-toxic and using them helps to prevent further exposure to chemicals that are dangerous to insects and humans alike. You also help the planet by preventing the addition of toxic chemicals into the environment. How do you keep garden pests out of your garden? Leave a comment below. 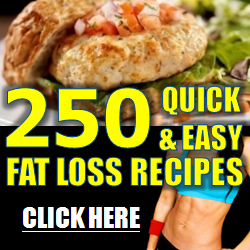 Get the latest posts delivered right to your email! Weed Killer: Is There a Cancer Risk? What To Keep Out Of The Garbage Disposal?